Recently, everyone’s attention has switched from fat to sugar as the main enemy when it comes to body weight control, obesity issue, and other health concerns. Organizations are calling to half the recommended daily sugar intake, sugar taxes are gaining ground, modifications to nutrition labeling highlight sugar - it really is in the spotlight. And it’s not only health organizations and governments that are taking action: consumers are also increasingly aware with 7 out of 10 in Europe trying to limit their sugar consumption, and more than half check the labels of their food for sugar content. To address the consumer demand and be ready for looming regulatory changes as well, get familiar with the 3 ways to reduce sugar. With this approach, sugar content is reduced little by little: e.g. by 5% every year. In this case, your consumers gradually get used to the evolving taste profile of the product and won’t reject it when you reach a 30% reduction level. Once reached, you can choose to either claim it, drawing attention to the improved nutritional profile, or do it silently as part of corporate responsibility and wellbeing strategy. In the latter case, you will avoid taste concerns which are sometimes triggered by sugar-related claims. Tip: remember that your nutritional label will have to change with each incremental reduction step. In order to be able to claim “reduced in sugar”, its content has to be decreased by at least 30% versus the original recipe. And of course, you can do more if you want. Claim-wise you can play with how to communicate around it: simply ‘less sugar’ or ‘reduced in sugar’, or indicating the exact percentage. In any case, don’t forget to reassure on taste: just like Thorntons with their ‘30% less sugar, 100% indulgence’ message. You can also choose to go all the way and get rid all of the sugar and replace it with sweeteners (fibers, polyols, stevia). This approach is much more widespread: probably because it’s more convincing and suitable for diabetics, too. 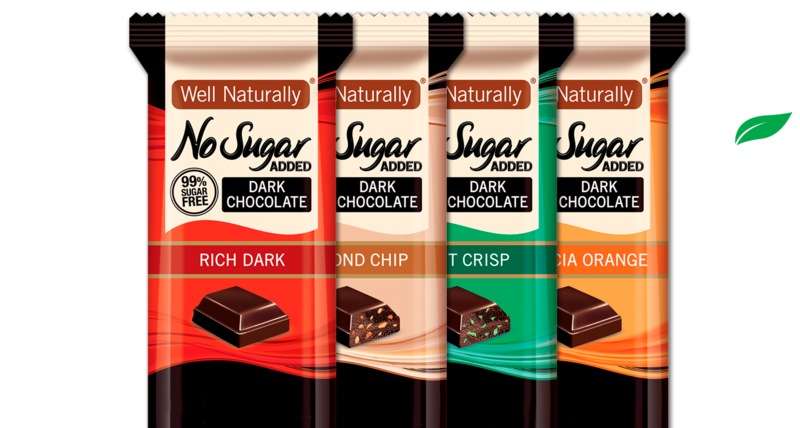 Moreover, it sounds more natural: ‘No added sugar’ - we did not tinker with the recipe by reducing ingredients, we just didn’t add anything unnecessary. You have to make sure there is no sugar of any sort. In this case, the recipe allows for some residual sugar, and lactose in the case of milk chocolate. Typically the sugar content on the nutritional label would be around 1%. It is common to combine sugar-related claims with others to either make the message even stronger or promote the friendly nature of the product. Check out some examples from the market! 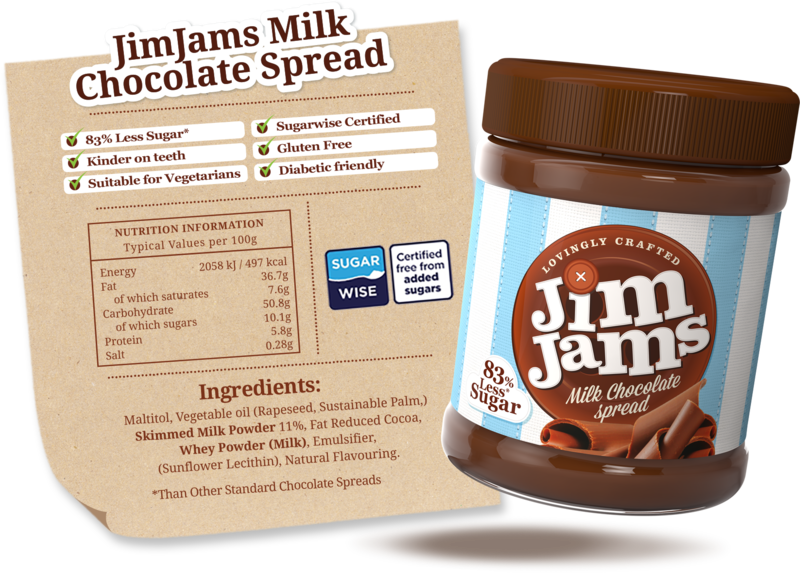 JimJams not only improves the nutritional profile but makes the product appealing on many other levels referring to certification, diabetes, tooth health. 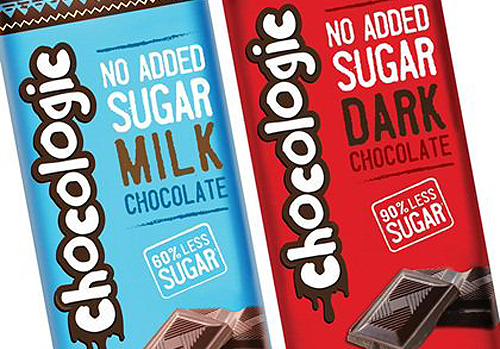 Chocologic and their No Added sugar range. On pack they make the benefit even more concrete by indicating how it’s different vs market standards = 60% or 90% less sugar. Well Naturally doubles the message: No Sugar Added and 99% Sugar-Free next to each other. Whichever path you choose to take when it comes to sugar, remember that ensuring your product tastes just as good is essential. Chocolate is there for pleasure, after all. Barry Callebaut has been developing a wide range of wholesome chocolate solutions fitting all sugar reduction strategies. Learn more about our product range and find out how we can support you.